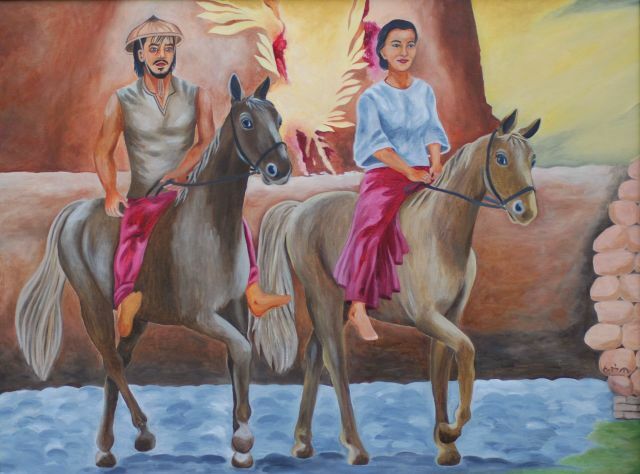 Diego and Gabriela Silang are two of the two of the many Filipinos who were brave enough to lead their people to rise against the Spaniards in order to gain our country’s freedom. While Diego works as a messenger for the Spaniards, Nicolas Carino (Gabriela’s Uncle) was committed in organizing a campaign against the Spanish rulers. He was arrested and imprisoned due to his rebellious activities. Due to this incident, Gabriela became worried and began asking around for help for the release of his beloved uncle. Working for the Spanish authorities, Diego promised her that he would do his best and became successful with his mission. After this, Diego became a frequent visitor of Gabriela and eventually fell in love and got married by the end of 1757. During his travel, Diego was held captive and imprisoned due to his rebellious activities. Nicolas Carino, Gabriela Silang and their followers rescued him, hailed him as leader and founded his revolutionary government. He assembled his team and carried out a war against the Spaniards within the Ilocos province and emerged victorious. Diego Silang became the governor of Ilocos Sur and continued his battle with the Spaniards and has won battles, one after another. Soon, he gained control over the next towns of Ilocos Norte and eventually dominated majority of Ilocos province. Pedro Becbec betrayed Diego and revealed their secret agreement with the Englishmen. Upon learning this, the Spaniards ordered Miguel Vicos to assassinate Diego Silang. Pedro Becbec returned to Vigan with the gunwielder and shot the governor. Gabriela reassembled their forces and pursued the battle against the Spaniards. She and her followers organized their headquarters at Pidigan and began attacking their camps. Soon, she became famous and enlivens the faith of her followers. The Spaniards became worried and began putting up a big force of soldiers against them. Being superior in arms and number, the Spanish forces easily overtook Gabriela’s team. Predicting their possible defeat, they withdrew and tried to fight as they were being chased but was eventually held captive. Soon, she and her followers were sentenced to death and were hanged one by one to serve as a warning to fellow Ilocanos. Now, she is remembered as the first female leader who fought for the country’s democracy and was hailed as the Joan of Arc of Ilocos.